Kedụ, Budget Magic lovers, it's that time once again! This week, we are heading back to Guilds of Ravnica to play a card that might be one of the most underrated in all of Standard: Hadana's Climb! The basic idea of our deck is to get a creature with two +1/+1 counters on it as quickly as possible—maybe as soon as Turn 2—and then flip Hadana's Climb into Winged Temple of Orazca, which gives us a land that lets us send our random creature to the air and double their power to close out the game in just a couple of attacks. Otherwise, the deck is a sort of weird +1/+1 counter–heavy Bant Midrange deck that playing some oddball creatures but wins in a pretty normal manner by attacking with random dorks. Is it finally time for Hadana's Climb to shine in Standard? Let's get to the videos and find out; then, we'll talk more about the deck! Bant Climb is essentially a +1/+1 counter–heavy build of Selesnya Midrange, splashing into blue for some sideboard cards and the namesake Hadana's Climb, which allows us to close out the game extremely quickly once it flips. Apart from the Hadana's Climb plan, we're mostly looking to beat down with a motley crew of creatures and hopefully kill the opponent in an extremely fair creature-y way. Hadana's Climb is the reason we're playing this deck, and it's one of the most underplayed cards in Standard. While it's very restricted in terms of the number of decks it actually fits into due to its +1/+1 counter subtheme, it's extremely powerful in a deck with a lot of +1/+1 counters flying around. The main plan of our deck is to flip Hadana's Climb into Winged Temple of Orazca, hopefully as early as Turn 3. Once we flip Hadana's Climb, we have a land that turns any random creature into a huge, evasive threat, so our primary plan becomes sending our biggest creature to the air (and doubling its power) each turn until our opponent is dead. The other upside of Hadana's Climb is that a second copy isn't that bad, assuming we've flipped the first. If we happen to find a second Hadana's Climb, we can intentionally put +1/+1 counters on creatures with less than two counters, slowly growing them into bigger threats. Then eventually, we get to the point where we have enough mana to activate the first Hadana's Climb, flip the second Hadana's Climb, and activate it too, which often gives us a flying creature with 20 or more power to close out the game in just a single attack! Our best way to flip Hadana's Climb is Chamber Sentry, which is another very underrated card in our current format. Because of the five-color ability, people tend to overlook Chamber Sentry unless they happen to be in a janky five-color deck, but the Construct is actually fine in a three-color deck, where we can play it as a 2/2 for two or a 3/3 for three with the additional upside of being able to shoot down smaller creatures by removing some counters. The main idea here is that we can play Chamber Sentry with two colors of mana on Turn 2, giving us a creature with two +1/+1 counters. Then, we can untap on Turn 3, play Hadana's Climb, put a third counter on Chamber Sentry, and immediately flip into Winged Temple of Orazca. While not quite as fast as Chamber Sentry, we have two more creatures that can flip Hadana's Climb immediately all by themselves, in Hungering Hydra and Knight of Autumn. Hungering Hydra is just a two-of, since it's pretty high variance. Against decks like Mono-Red or Boros that are using mostly damage-based removal, Hungering Hydra is the best card in our deck. If we can get it up to a 4/4 or 5/5, not only does it basically become unkillable, but if our opponent damages it with a Lightning Strike or attacks into it, Hungering Hydra also grows into an even bigger threat. 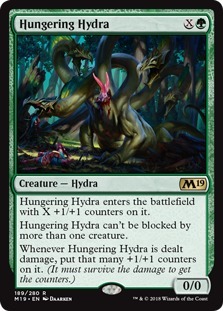 On the other hand, against decks playing Cast Down or Vraska's Contempt, Hungering Hydra is much less exciting, being not all that efficient and dying to most of our opponent's removal. Meanwhile, Knight of Autumn (probably better know as Swiss Army Knight) gives us a creature that does a bit of everything. 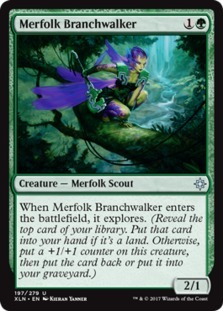 The main reason it's in the deck is that we can play it, add two counters to it, and immediately add a third counter with Hadana's Climb to flip the enchantment, but being able to kill an artifact or enchantment is helpful against cards like Search for Azcanta, Ixalan's Binding, or The Immortal Sun, while gaining life makes it relevant against burn-heavy decks like Mono-Red and Boros. The other upside of both Hungering Hydra and Knight of Autumn is that they are big. Five power is sort of a magic number when it comes to Hadana's Climb, since it means just two attacks doubled by Winged Temple of Orazca gives us a lethal 20 damage in the air! Both Pelt Collector and Merfolk Branchwalker are good with Hadana's Climb. 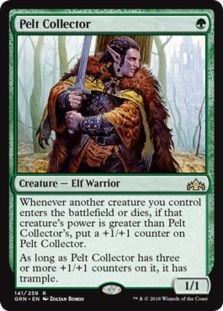 Pelt Collector can slowly grow up to three +1/+1 counters by itself as we play bigger creatures, and Merfolk Branchwalker starts off with one counter if we hit a non-land with explore. But they are even more important to our backup plan, which is curving out and winning like a normal, aggressive creature deck. While our most exciting games involve flipping a Hadana's Climb, with only four copies of Hadana's Climb in our deck, there are plenty of games where we don't draw a copy. In these games, playing Pelt Collector into Merfolk Branchwalker into Knight of Autumn and beating down with our motley crew of creatures is our best plan for winning the game. Venerated Loxodon and Song of Freyalise do double duty in our deck. They do work with our Hadana's Climb plan by putting +1/+1 counters on our creatures, but they are even more important to our backup plan of simply beating our opponent down. 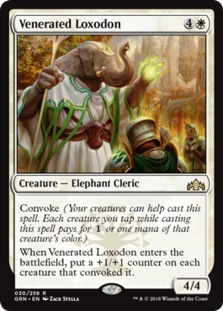 Venerated Loxodon often comes down on Turn 3, giving us a big body and putting counters on a couple of early-game plays. Meanwhile, Song of Freyalise gives us the ability to tap our creatures to add mana of any color, which gives us a weird backdoor way to return Chamber Sentry from our graveyard to our hand, although the main reason it's in the deck is to grow our team with the third lore counter. Rounding out our main deck are two copies of Assure // Assemble and a playset of Llanowar Elves. 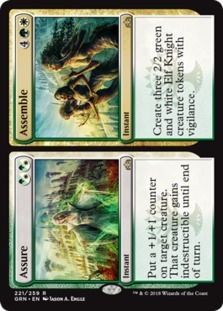 Assure // Assemble is mostly in our deck to save a creature from removal, with the upside that it adds a +1/+1 counter to the creature for Hadana's Climb–flipping shenanigans, although it's also nice that we can cast it for six mana in the late game to make some 2/2 tokens. 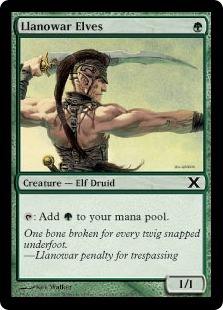 As for Llanowar Elves, it just speeds up the deck, allowing us to play Hadana's Climb as early as Turn 2 and immediately start getting +1/+1 counter value by adding a counter to the Llanowar Elves itself. The record this week is a bit weird. You might have noticed that the match versus Mono-Red was a bit blurry. The reason is that something went wrong with my video-recording program, and I had to re-record pretty much the entire episode (I left in the Mono-Red match because of the sweet Hungering Hydra kill). All in all, I played 10 matches with the deck and finished with a record of 6-4, which is pretty solid for a budget deck, especially considering our sample size is almost double the norm, thanks to all of the lost matchups. The deck itself is pretty powerful. Hadana's Climb is great, making any random creature into a huge threat, and our deck is really good at flipping the enchantment early. Chamber Sentry is a card to keep an eye on—it's a lot better than people give it credit for. Combine that with a bunch of good value creatures, and we've got a deck that can compete with many of the best decks in the Standard format. Perhaps the biggest upside of the deck is that it has the ability to win quickly, which we saw on display against control. Sometimes, we just draw a couple of Pelt Collectors, play some random creatures, and get the curve-out win. 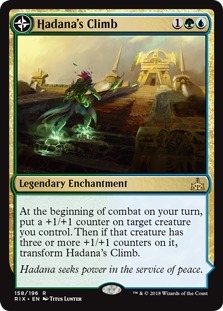 If this plan doesn't work, Hadana's Climb gives us a powerful backup plan. Normally, creature decks struggle to get back in the game after something like a sweeper, but thanks to Hadana's Climb, just about any creature we manage to get on the battlefield can become a huge, potentially game-ending threat, which makes it easier for our deck to fight through removal. As far as upgrades to make to the deck, the biggest issue—by far—is the mana. You probably noticed that we skimped a bit on dual lands and instead made do with a few duals and Evolving Wilds. This is because the optimal 16 dual-land mana base is really expensive, with just the lands being more than $100. If you have buddy lands and shock lands in your collection, the easiest way to improve the deck is to max out on Hinterland Harbor and Glacial Fortress while also adding in a playset of Temple Garden. While the mana is functional enough, across the 10 matches I played with the deck, we did have a couple of games where our mana base was a bit of a problem. Otherwise, the deck felt pretty solid in its current form. All in all, Bant Climb is a deck that feels good today—more than competitive enough to compete at the FNM level—but should be even better in the future. Remember, Ravnica Allegiance will bring with it both Simic and Azorius, which at the very least means the deck will have great mana, and thanks to Simic's traditional +1/+1 counter theme, it's also possible that we'll get some sweet non-land additions as well. If you like +1/+1 counters, growing creatures into huge threats, and beating your opponent down, give Bant Climb a shot! Bant Climb is a really tricky deck to get down into the ultra-budget price range. 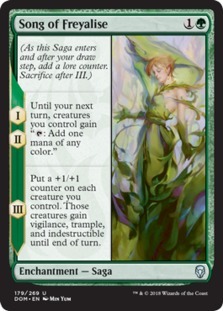 The mana in the budget build is already fairly rough, and the only realistic way to get the ultra-budget build down near $50 is by making the mana even worse by turning Sunpetal Grove into Tranquil Expanse. 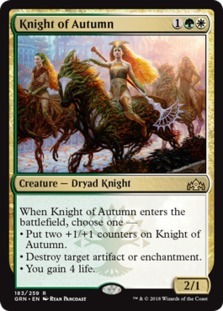 We also lose Knight of Autumn and Merfolk Branchwalker and replace them with Gird for Battle for more +1/+1 counter fun and Untamed Kavu, which offers some nice value, especially if we can kick it. In all honesty, outside of the kitchen table, I wouldn't feel very comfortable playing this version of the deck. The mana is clunky, and it loses some of the best creatures to get it down into the ultra-budget range. If you want a super-cheap Hadana's Climb deck, something like Merfolk with Hadana's Climb is probably a better ultra-budget option. The same is doubly true on Magic Arena. The deck we played for the videos is cheap in paper or on Magic Online, but it contains a lot of rares and mythics. Even our ultra-budget build has 23 rares in the main deck. If you're looking to climb on the cheap, upgrading the Merfolk starter deck to include Hadana's Climb is a much better option than trying to downgrade Bant Climb into Arena budget form. This being said, if you want to try to build a cheap version on Magic Arena, a hybrid token / +1/+1 counter theme as seen above is probably the best route—just be warned that the mana is extremely close and clunky. Finally, we have our non-budget build, which is pretty similar to the deck we played for the videos but with the ideal mana base and a handful of important additions. Ajani, Adversary of Tyrants is a solid planeswalker for the build, working well with the +1/+1 counter theme and giving us a weird way to generate card advantage in slower, removal-heavy matchups by reanimating small creatures. Vivien Reid is similar, giving us repeatable card advantage and removal for annoying threats like Crackling Drake and Niv-Mizzet, Parun along with random artifacts and enchantments. We also get Carnage Tyrant in the sideboard as a way to fight through control. While this is the build of Bant Climb I'd play at a Grand Prix, it's worth mentioning that the biggest improvement you can make to the deck is fixing the mana. Even without any of the other upgrades, the build we played in the videos with the non-budget mana base would be a huge improvement. Anyway, that's all for today. As always leave your thoughts, ideas, opinions, and suggestions in the comments, and you can reach me on Twitter @SaffronOlive or at SaffronOlive@MTGGoldfish.com.